Little known: Most of David Cameron's back office are unknown with the exception of Steve Hilton. Inexperienced: Michael Portillo observes that the team is "bright", "nice" but a "bit thin." He continues: "It's not surprising. The Tory party has lost layer after layer of talent over the past decade or more." Ed Llewellyn, Cameron's chief of staff, was aide to Hong Kong Governor Chris Patten, however, and also adviser to Paddy Ashdown whilst the former LibDem leader was in Bosnia. "Nice": "Gabby Bertin, Cameron's press officer since the latter stages of his leadership campaign, is quick to frame this new political etiquette in party terms. "People love to make the comparison between us and Labour in the 90s. We couldn't be more different. We're honest. We're transparent. We don't go around threatening people. We don't go round lying." A Cameron aide has a more worldly explanation: "In the 90s Labour seemed wet and needed to show they were tough. Our problem is the opposite."" Loyal: Cameron has picked people he knows and trusts. He does not want to repeat the mistakes of past leaders who accepted the recommendations of colleagues and ended up with staffers who weren't necessarily loyal to - or understanding of - the mission. Young: "Bertin is 28 and has only been working in politics for four years. Danny Kruger, one of Cameron's two speechwriters, left university in 2000. Osborne, Hilton and the Conservatives' campaign director George Bridges are still in their 30s. Cameron's chief of staff, Edward Llewellyn, is barely 40." Male and Etonian: "Bridges' trajectory is typical. Like Cameron, Kruger and Llewellyn, he went to Eton. In public most of the Cameroons dismiss this as a minor biographical coincidence, but it's nothing of the sort. Eton has a unique ability to produce Conservative politicians... Eton is also, of course, all male. The Cameroons are also mostly men. Most of the women involved tend to be in more minor roles." More 'right-wing' not so long ago: "[In 1999] Bridges called the respected environmentalist Lord Melchett, then director of Greenpeace, "evil" and "anti-progress" in his column in the Times. Cameron's current press secretary, George Eustice, remained a prominent activist for the UK Independence Party and other Eurosceptic groups until 2003. In 2002 he publicly defended a cinema advertisement in which an actor, dressed as Hitler, endorses the euro." Close to Blairites: "Nowadays, for all their declared distaste for New Labour's methods, Cameron's people remain respectful of Blair and his machine. Some of the admiration is personal and mutual. Hilton is friends with Tim Allan, Blair's former press officer and still an influential Blair advocate. Rachel Whetstone, Hilton's partner and a semi-detached Cameroon, is friends with Ben Wegg-Prosser, 10 Downing Street's head of strategy. Wegg-Prosser gave a reading at the wedding of the Conservative MP and Cameroon Ed Vaizey. Some of this is just the usual mingling of sharp Westminster operators with networking instincts and work in common. And, of course, both groups are united in their dislike of Brown." Hungry to be governing again: "A more junior team member, whose politics are to the right of his leader's, has a more long-term worry. He fears that in downplaying traditional Conservative causes, in changing the party to be more in tune with modern Britain, the Cameroons have in effect accepted that they won't change the country much in office... But then he changes his tone. "I don't want to spend another five years in opposition doing this nonsense," he says with sudden fierceness. "I want to be handing policies to civil servants, not journalists." ...The Cameroons are not really a clique or a nice new kind of Tory. They are part of a tribe accustomed to running Britain. They think it is well past time they had another turn." The profile seems pretty fair although it would have been better if it had emphasised the significance of Steve Hilton's role. He is the absolutely dominant influence on Project Cameron. More could still be done to beef up the press operation. Journalists regularly refer to this as a weakness. Desmond Swayne MP, David Cameron's PPS, should probably have been mentioned. Despite that leaked email business he is undoubtedly a fine PPS - giving excellent advice and keeping David Cameron connected with the right of the parliamentary party. Outside of the immediate circle I would highlight the roles of Stephen Gilbert and Lord Ashcroft. Gilbert and Ashcroft coordinate the party's polling and have a big influence on the nature of information that David Cameron sees. Male and Etonian: "Bridges' trajectory is typical. Like Cameron, Kruger and Llewellyn, he went to Eton. Much, much, much too young. Surely politics is something you need a bit of grey hair for. 'life experience' is how they put it I think. Little mention of Letwin which makes me question the research. With all of these young guns around it's no wonder that Curly's staff, and some of the customers, think that Cameron is a bit dishy. Do you think that the female vote is all that influential? I thought the article highlighted Letwin's role as a moderniser? Only the one paragraph Scotty. Thought he would be recognised as being a little more instrumental in his current role. Perhaps the fact that he's experienced would have taken away from the real reason for the article, which is to paint project Cameron as a bunch of young toffs. (perhaps to compliment Hitchins programme next week). "Perhaps the fact that he's experienced would have taken away from the real reason for the article"
Must admit that was exactly what I thought when the article did not highlight the importance of Letwin's current role. Interesting but doesn't really say much that we didn't already know: a tight-knit group of largely well-heeled patricians who see politics as a big game where it is "their turn" to operate the levers of power. By their own admission, they will probably leave their inheritance from New Labour largely intact. Back to the 1950s, then. 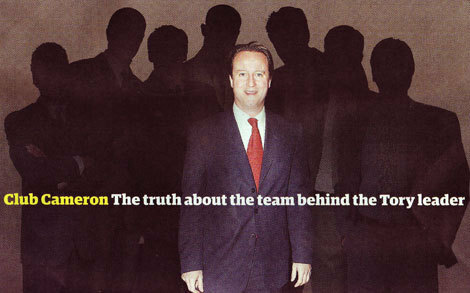 It seems Cameron has some very loyal and professional people around him. Friendships often cross party-political lines - nothing new or wrong about that! Just look at the Shadow Home Secretary, David Davis. His good friend is none other than Alistair Campbell! Ring a bell? LOL. Just look at the Shadow Home Secretary, David Davis. His good friend is none other than Alistair Campbell! Doesn't that go back to the proposed LBO of the Mirror when Davis was in a consortium and Campbell at The Mirror ? "Ed Llewellyn, Cameron's chief of staff, was aide to Hong Kong Governor Chris Patten, however, and also adviser to Paddy Ashdown whilst the former LibDem leader was in Bosnia." I'm disappointed - I would have expected an onslaught of faux outrage from the trolls and malcontents at this particular observation by now. Wake up, 'Alex Forsyth'! dont underestimate lord ashcroft. quiet but when he does speak!!!!! I'm disappointed - I would have expected an onslaught of faux outrage from the trolls and malcontents at this particular observation by now. Why? Paddy Ashdown fits Cameron's image and the choice of staff what I more or less expected. "Why? Paddy Ashdown fits Cameron's image and the choice of staff what I more or less expected." And why no mention of Cameron's "other" speechwriter? Step forward the great Douglas Smith, star of FCS in its "Hang Nelson Mandela" days, former short-term resident of Brixton Gaol and mastermind of Fever Parties, Britain's hottest, hippest orgies. Isn't rather odd - I mean really odd - that such a luminary gets left out?